Implementing a successful social business platform can be beneficial for companies, but where to start? When you introduce a social business platform, you are likely to see benefits in at least one of four areas: hard dollar savings, improved outcomes (i.e., higher win rate), accelerated outcomes (i.e., time to close deal) or productivity gains. Your team/department/company will value each of these outcomes differently at different times. Let whatever outcome your team values most determine where you start. Then choose a project that will enable you to capture benefits in one of these areas. In the previous chapter, we focused mainly on business value implementations and de-emphasized the aspirational, wall-to-wall projects. This was intentional. 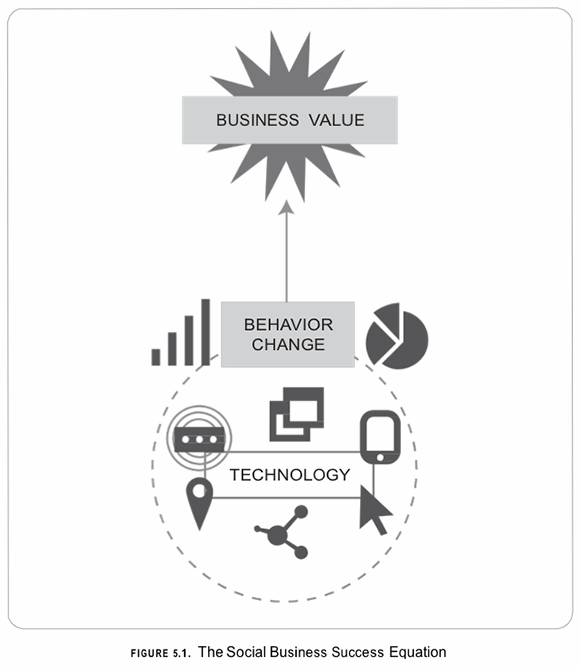 Your best chance for success with a social business platform is to start with a defined use case. Some popular use cases are employee onboarding, sales enablement, customer service, and marketing campaign/event management. 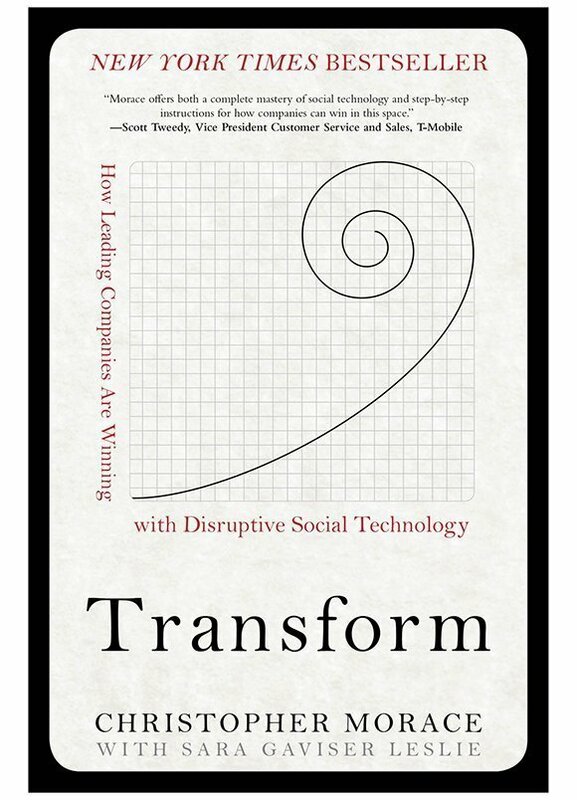 This is excerpted from Transform: How Leading Companies are Winning with Disruptive Social Technology, by Christopher Morace and Sara Gaviser Leslie,©2014. Reprinted by permission of McGraw-Hill Education. Read the entire chapter. Buy a copy of the book. Once you've decided on your first implementation, you need to build a business case. The business case justifies why you are embarking on the particular project you've selected. It asks, "Why change and why now?" A lot of companies skip this step because they don't know how to do it. Don't follow their lead! You need to be able to present a business case that will move your enterprise to a better place. This place is one where you are not just working harder, but you are reaching those outcomes that are important to your business in terms of top-line and bottom-line metrics. When you start with a specific use case, you can be clear on the benefits that you expect from the platform. With a wall-to-wall implementation, it's very hard to know what the technology's impact will be over time. Without that insight, it's a challenge to give people a real reason to learn how to use the platform and eventually adopt it. The challenge here is to prove that the platform will have an impact on a specific process. The benefit of focus is that you can be very clear about what you will do on the social business platform. Even before you put it into team members' hands, you must offer them a business value assessment or estimate of quantifiable effect that the platform will have on a certain process or function. First, establish benchmarks both for your industry and for your company. Then project the value that you expect the platform will create. 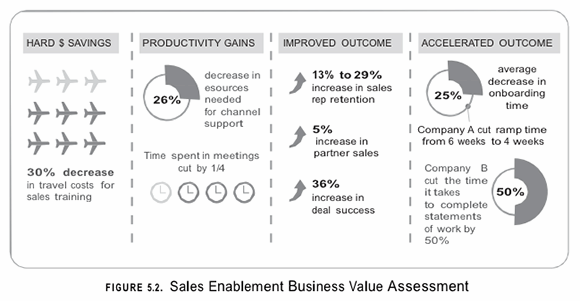 Consider a sales enablement implementation in a sales organization of a large consulting firm. You predict that enabling the sales team with the right information and tools will increase the win rate and reduce cost of sales. 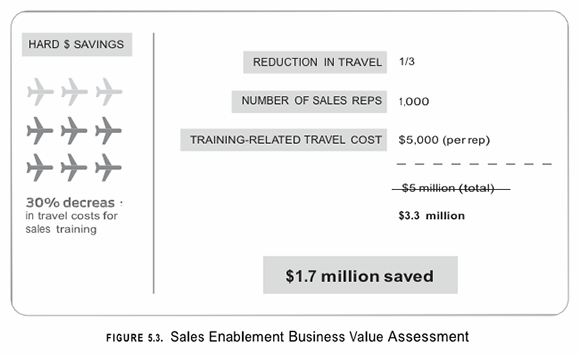 Below is an illustration of how the firm saved $1.7 million when it introduced a social platform for sales enablement. First, leaders estimated how the platform would lead to hard dollar savings, productivity gains, improved outcomes and accelerated outcomes, as shown in Figure 5.2. When the firm drilled down in hard dollar savings, the company estimated that decreased travel -- and that alone! -- would lead to a $1.7 million savings. A simple calculation is shown in Figure 5.3. While the example above is very high-level, the more detailed you can be about the impact you expect to get, the better. Make well-judged assumptions about your business, find benchmarks to compare against, tailor those benchmarks to your business, and finally, project a number and show why it is achievable. 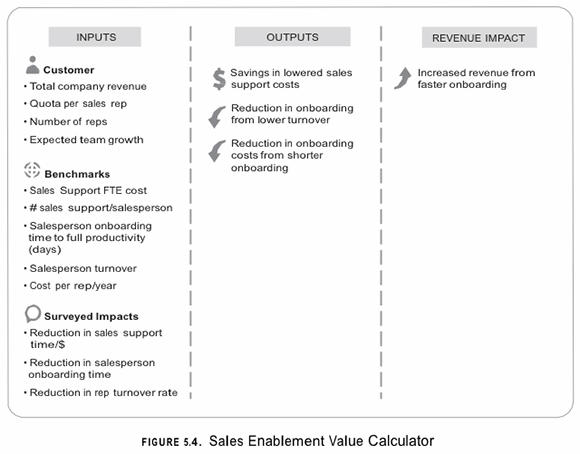 Figure 5.4 shows ample inputs, outputs and overall revenue impact of a social business platform for sales enablement. If, alternatively, you'd started with a wall-to-wall rollout, you have no guarantee that people will use the platform for anything that provides business value. People might just get on and talk to each other. Not that communication is bad, it's just not that valuable to have yet another communication tool. When you roll out the platform to the entire company at once, you have no goal or specific quantitative outcome. You leave a lot to serendipity. When you start with a discrete use case, you can be clear about what you hope to get as a result. We all want to escape the Red Queen's race; we want to reach that wonderful future where social technology transforms an enterprise. The only way to get there is by adding many successful rollouts -- well-understood use cases -- together. When you can point to these examples, you make it make it crystal-clear that the social business platform is working. Intention and behavior change is everything. Just throwing a social platform on your business and commanding it to change won't work. It's like the Red Queen telling Alice to run faster. These individual use cases are like individuals or even states in a grassroots movement. U.S. Supreme Court Justice Louis D. Brandeis once commented that this bottom-up adoption also works in the United States: "It is one of the happy incidents of the federal system that a single courageous state may, if its citizens choose, serve as a laboratory; and try novel social and economic experiments without risk to the rest of the country." What's holding back your social media launch? Similarly, departments in a larger corporation can implement a social platform on a small scale first before taking on a risky rollout that involves the entire organization. Each functional use case you initiate in your enterprise is like a load-bearing pillar. Each pillar represents a clear articulation of why the team is using it. Each pillar is also a small win in the journey toward a wall-to-wall connected company. But it is an experiment nonetheless. The more pillars you erect, the more ways you change the way people work in your organization, the stronger your organization becomes and the more connected your employees are to the technology. Once you have several pillars firmly grounded -- several business or function specific implementations in place -- the final stages of connecting everyone in the organization happens fast. What key features do today's leading social CRM tools offer? Is your digital content strategy achieving business outcomes?